Who doesn’t want to own a pool in their homes? A private pool is perhaps an enthusiastic water lover’s dream come true. Imagine the luxury of diving in cool or warm water (whichever you prefer) whenever you want. However, if your pool is an outdoor addition to the home, it might become useless in weathers that bring dust, rain or snow with them. In such a situation, it is recommended that you invest in installing a pool enclosure. An enclosure will not only protect your clean blue pool from dust but allow you to swim even in rain or snow without disruption. A pool enclosure can be a glass structure that comes with a retractable roof. It can also be a structure made out of metal and screen to prevent bugs, insects, dust and stray leaves to contaminate your water and protect the pool against different types of weather. A pool enclosure keeps out soil, leaves, creepy crawlies, insects and debris out of your pool. However, it is important that these enclosures are maintained by cleaning it. Cleaning your enclosure is the key to preserving your screen and the frame. Cleaning your screen enclosure isn’t that difficult at all. A pool enclosure can save you from a lot of troubles associated with pool keeping. Keeping a pool in good condition means that you have to find the right mix of chemicals. It is a difficult task since a large amount can cause irritation in the eyes and mouth while a low amount will cloud the surface of the water due to the collection of bacteria. An enclosure will help reduce the pool’s exposure to phosphates, pathogens and pollutants which in turn will reduce the use of chemicals. Enclosures come in varying designs and options. You can install enclosures with insulation that will keep the enclosure warm in the winters. Quality insulation will protect the swimmers against harmful UV rays of the sun while keeping the warmth of them inside. Enclosure roofs are retractable as well. 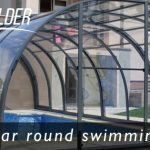 If your exercise routine consists of swimming and cold weather stop you from continuing that then you a pool enclosure will solve your problems. A pool enclosure with the right insulation will keep the indoor swimming area warm in chilly weather so that you can continue your exercise all year long. Animal intruders are common if live around some open area. Pool enclosures will protect your swimming water against these animals and will also protect them from getting trapped and drowning in the pool. Pool enclosures come with advanced technology that helps save energy resources. You will find your heating and cooling bills significantly reduced with quality energy efficient enclosures. Continued exposure to the sun can cause the water not to only heat up but evaporate quicker. You can use enclosures to save water when the pool is not in use. The areas around the pool can turn icy and slippery in the winter season. An enclosure will keep the cold air out to prevent such situations. People can injure themselves on these icy surfaces. Pool enclosures will lessen a number of such accidents. The many benefits of a pool enclosure make it a good investment. Installing and maintaining the pool can be expensive in itself. The enclosure might be initially expensive to install but it reduces the long-term costs associated with the maintenance of the pool. There are different types of pool enclosures available in the market. You can choose the design, material and colour according to what suits you and matches the rest of your house. Moreover, a pool enclosure adds more sophistication and a touch of modern technology to a traditional pool. A proper pool enclosure will increase the life of the actual pool. Would you like to get more information about a pool enclosure for your pool? We install swimming pool covers and total pool enclosures in Montgomery County Texas for new swimming pools and can be done during a swimming pool renovation.